Man, this game is a blast. Arkham Asylum is one of my favorite games, and how do you top it? Well, you keep all the cool bits and then add more. For those who came in late, in Arkham Asylum you played Batman, dealing with Joker’s takeover of the asylum. It had a combat mechanic that worked great once I got past the urge to mash buttons. You have to get into a rhythm of swinging the mouse around to face someone (aim is only approximate) and hitting the mouse once, paying attention to impending attacks to block them, and using your combos which are unstoppable and also give you a moment’s breathing room. And then the stealth… in other games this is mostly a matter of holding down Ctrl. It’s fun in AA because there’s a whole slew of things you can do: silent takedown, ledge takedown, gargoyle drop, batarang attack, signalling suicide collars to break up the pack, to say nothing of swinging around up in the heights or tunneling through vents. Plus the thugs get increasingly terrified. 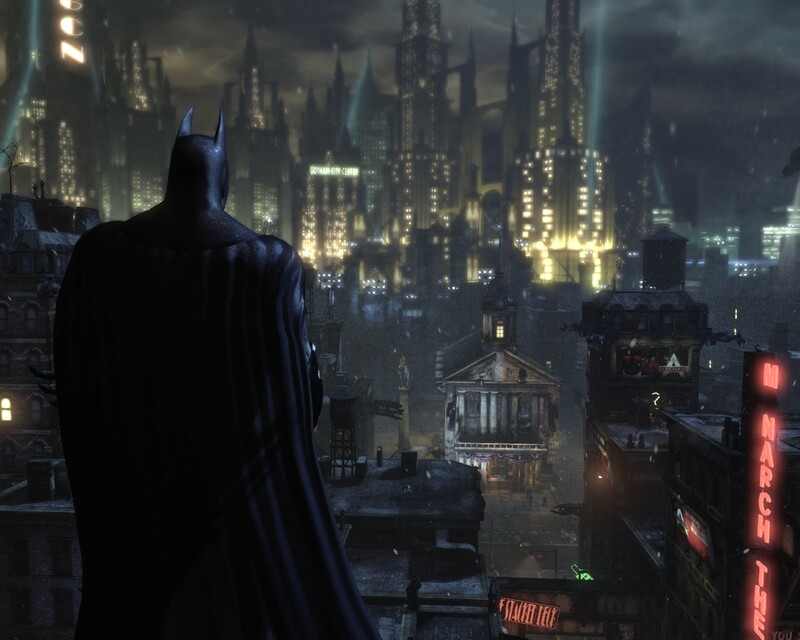 This game turns a whole swath of Gotham into a sprawling prison city. Yeah, that's gonna work out well. Tooling around the city is fun, because you can glide and grapple almost everywhere. You can take any route you like, and sometimes find challenges or side missions along the way. There’s usually knots of thugs here and there… you can avoid them or take them out. If you got fairly good at the mechanics in Arkham Asylum, the good news is that you can use all your skills here– the basics are the same, and you start with most of the extras from the first game. Plus there’s exciting new gadgets and moves. 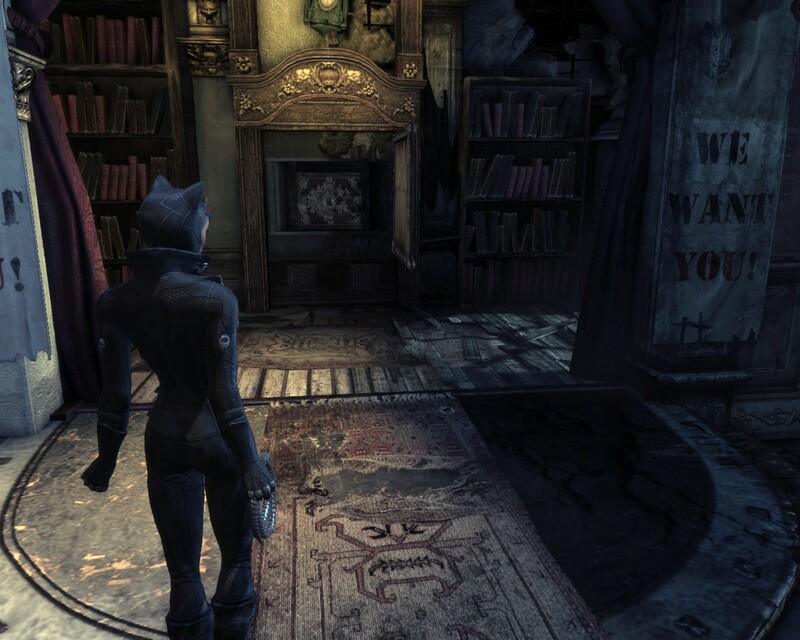 Gameplay as Catwoman is similar to Batman, but she has her own toys and moves. She doesn’t have a grapple but a whip, so she moves across the cityscape a little differently; she has a whip attack as a combo move… it’s just different enough to be fun. Plus she is particularly cute in steath mode… she crawls around like a cat. She may overplay the sultry femme fatale a bit… but hell, Batman overplays the macho badass. And she can take out a roomful of thugs just as fast as Batman. (Just how she does it isn’t completely clear– she must weight half a thug. Let’s just say it’s momentum.) So far she adds a lightness that’s a nice contrast to the relentlessly serious Bats. I do have to complain about Games for Windows Live, which you have to sign in to even for single player, which is just megastupid. At least you can ignore it once you’re in.